This recipe is part of the Food Network monthly cooking club challenge. Of course being a chocolate cake I couldn't resist. It's nice when recipes only use four ingredients. Four ingredients that you are pretty likely to always have on hand. For anyone who has gluten allergies or looking to avoid gluten in general, Flour happens to NOT be one of the ingredients. This is a great example however of how flour-less recipe does not mean healthy. A common misconception that has been occurring lately in the world of baking. 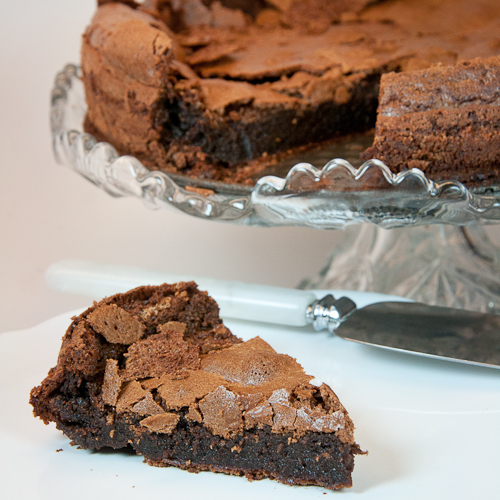 I digress, the four ingredients of sugar, chocolate, butter and eggs are compiled together to create a rich, moist cake with a delicate crust. I decided to leave the recipe as is except for a reduction in sugar of 1/4 cup. I also cannot guarantee my chocolate was 70% as the recipe also stated. My bar of chocolate didn't say, it just said dark, which worked fine for me. 1) Heat the oven to 375°F/190°C. Line with parchment, grease or spray a 9-inch springform pan. 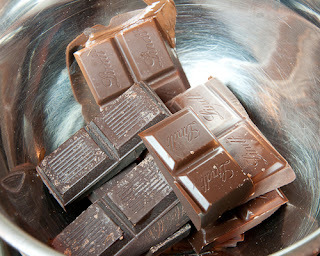 2) Melt the chocolate gently over a double boiler. then whisk in the butter a piece at a time until smooth. 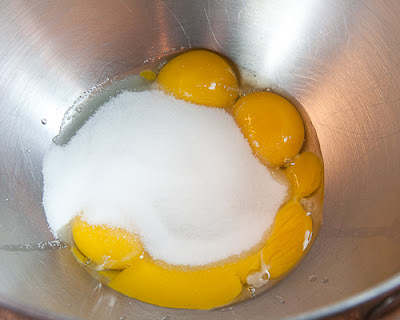 3) In a large or your mixer bowl, beat the yolks with half the sugar until thick and pale. 4) In a medium bowl, beat the whites to peaks. 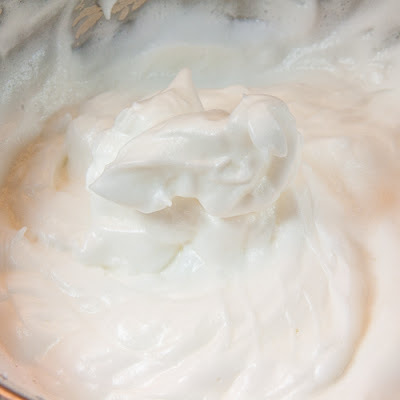 Add in the remaining sugar and beat to a stiff meringue. 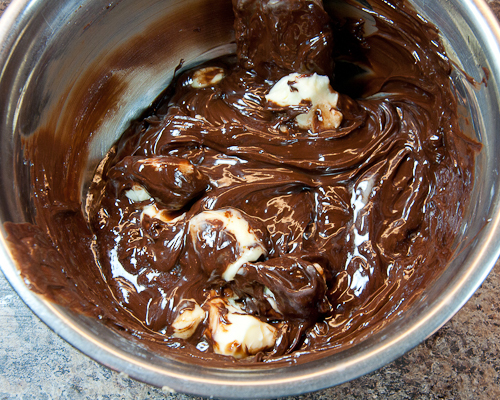 5) Slowly whisk the chocolate mixture into the yolk mixture. 6) Stir in a 1/4 of the egg white and fold into the mixture. Repeat until all the egg whites are added. Pour in to the prepared pan and bake for 45-50 minutes. 7) Remove from the oven. Run a knife around the outside edge, then let sit until cool. It will sink down and the top will crack, as it is supposed to. This recipe is very easy to put together. 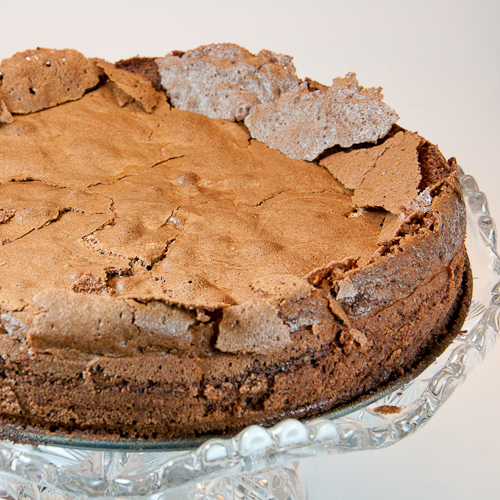 I felt it was more like a brownie than a cake, no matter what you call it you can't go wrong. It's a chocolate lovers dream. The outer crust that puffs and falls is like a crunchy protective layer to keep the cake moist. Yours were uber craggy! I love it! And you're right, this is not a healthy cake. I don't understand why people are so scared of gluten (unless they're celiac of course) when this is actually a cholesterol bomb! oh gosh 4 ingredients? you're making this too easy for me! hi, i have a question.. what are the measures for ounces? grams? thanks! It says ounces in the ingredients. If this cake isn't Pin worthy, I don't know what is! So fudgy and I love the crunchy top!